Nestled in the heart of Nelson Bay overlooking the crystal blue waters, magical native flora and wildlife The Landmark Nelson Bay provides the perfect setting for a weekend getaway or relaxing holiday escape. 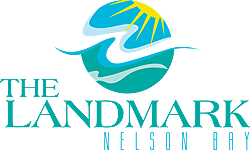 The resort is bounded by the 27-hole Nelson Bay Golf Course, offering both a stimulating course and picturesque surrounds. Hire a cart or enjoy the scenic walk while being accompanied by local wildlife. For avid golfers tailored packages have been created to suit your desired holiday needs, while having an array of facilities both on-site and nearby to keep your loved one, family or friends entertained. * Subject to availability, not available school holidays.